Travel brochure for the "Imperial Hotel, Tokyo, Japan," circa 1935. The architect of the hotel was Frank Lloyd Wright. Travel brochure for the "Sacred-Island Miyajima - Miyajima Hotel," circa 1936. Travel brochure "Kobe Invited You," circa 1934. Travel brochure "How to See Osaka," 1935. Published by the "Japan Tourist Bureau." Luggage label for the "Imperial Hotel, Tokyo, Japan," circa 1935. The architect of the hotel was Frank Lloyd Wright. Travel brochure for "The Gamagori Hotel," circa 1935. Travel brochure "Nagaragawa Hotel," circa 1936. 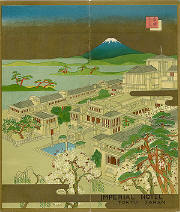 Travel brochure "Nikko for Your Holiday," circa 1935.